Cigarettes are one of the most smuggled ‘legal’ products in the world, and cigarette smuggling is a form of transnational organised crime (US Department of State, 2015). Evidence shows many high-profile terrorist organisations such as Al-Qaeda operate smuggling rings due to higher profit margins and relatively lower risk (US Department of State, 2015). 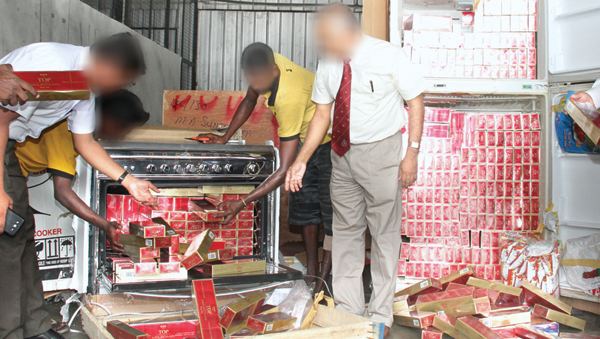 Sri Lanka’s having one of the highest cigarette prices in the region has led the country into the hands of illegal cigarette smugglers who make huge profits. The trend of consistent tax hikes from 2009–2015 created the ground for a large and unprecedented hike in 2016 which hampered the objectives of both the Health Ministry and the Finance Ministry. High taxes play a significant role in incentivising the smuggling of cigarettes, the Research Intelligence Unit’s (RIU) 2018 report “Towards Sensible Policy Reforms to Combat Illicit Tobacco Markets” said. “In the context of Sri Lanka, the price differential between legal and illicit is about Rs. 25 per stick for cigarettes and about Rs. 2 per stick for beedi,” it says, while the distribution of illicit cigarettes is much easier and more organised than that of drugs such as heroin. Estimating the size of the current illicit tobacco market is a crucial step towards benchmarking and assessing the effectiveness of actions to curb the growth of the market. Since the illicit market is not directly observable for multifarious reasons, an indirect approach was required to estimate its size. As per the analysis, the illicit market share is around 14 percent to 18 percent for cigarettes and 26 percent to 29 percent for beedi, which translate to 500 to 700 million sticks of cigarettes and 1,400 to 1,700 million sticks of beedi in 2018. In other words, the illicit cigarette market turnover could be anywhere between Rs. 15 billion to Rs. 20 billion, which is about 11 percent to 15 percent of the legitimate market size, while illicit beedi market is worth Rs. 4 billion to Rs. 5 billion, which is about five percent to six percent of the legitimate market. 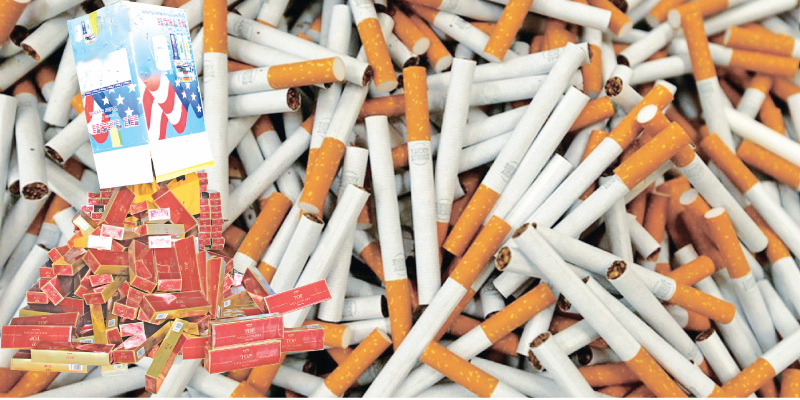 This massive size of the illicit market means loss of revenue for the government, to the industry, and for those whose livelihoods are connected with the tobacco industry, such as tobacco farmers and beedi rollers. In addition to the above, it can be observed that the size of the illicit market has risen to 14 percent or more by 2017. This calls into question the government’s policy towards the industry and the efficiency of the enforcement agencies. 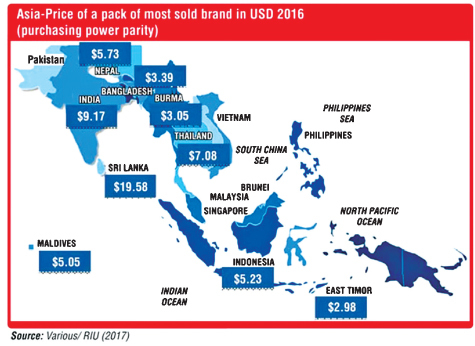 RIU says there is strong evidence to suggest higher taxes are a key reason for increased smuggling levels in Sri Lanka. Over the years, there has been a reduction in legitimate cigarette sales, while the consumption of beedi has been increasing. This indicates that consumers are switching to beedi as a cheaper alternative to cigarettes. This took place in the backdrop of a continually increasing excise tax environment. Therefore, it can be concluded that high taxes have a strong connection with the illicit tobacco trade. According to the authorities and other sources who met during this research, a 40-foot container of smuggled cigarettes can add up to a profit of between Rs. 250 to Rs. 400 million (RIU, 2018). This softer penalty makes the risks associated with smuggling highly acceptable to criminals. The enabling factors according to WHO are weak governance or lack of high-level commitment; ineffective Customs and excise administration; corruption and complicity of cigarette manufacturers; and presence of informal sectors or informal distribution channels. However, a recent study done in the US found that there is a correlation between illicit market share and tax rates (Tax Foundation, 2015). Figure 1 illustrates how smuggled cigarettes move from low-tax jurisdictions to high-tax jurisdictions in the US. The data points (green dots) represent the illicit share in each state. Negative data points indicate outflows, while positive data points indicate inflows. When a trend line (dotted red line) is drawn, it is trending upwards. 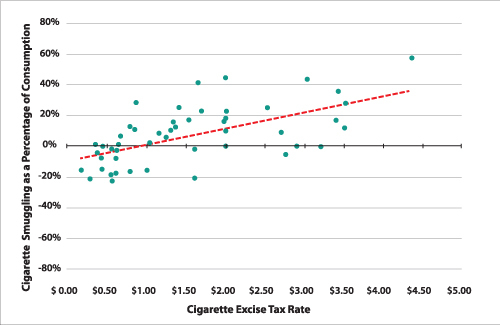 Therefore, it is evident that as the cigarette excise tax rate increases (horizontal axis), cigarette smuggling as a percentage of consumption rises (vertical axis). The illicit tobacco trade has resulted in huge losses to governments in the form of loss of taxes. Building on the analysis in Figure 1, RIU calculated the revenue loss to the government from illicit tobacco. The loss figures were arrived at by using the extrapolation of income from legitimate tobacco sales. To put things into perspective, the government has spent close to Rs. 40 billion for the Samurdhi programme last year. The loss of tax revenue from illicit tobacco is equivalent to 27 percent to 40 percent of the annual Samurdhi spending. Therefore, if converted to legitimate sales, the government could have spent this revenue on productive economic or social activities.